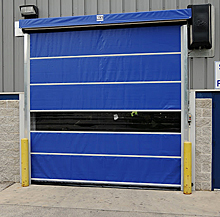 Vinyl panel roll-up doors have the added benefit of high-speed cycle rates, wind and weather resistant durability, and helping to separate temperature zones in a light-weight door that is impact resistant and that snaps back into place after a forklift impact or extreme wind gust. The vinyl is sturdy 18 oz. 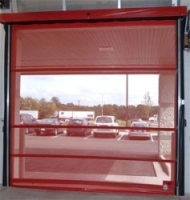 coated colored vinyl and each door includes one clear panel with window quality visibility. Whether using in an exterior application at the loading dock or an interior location between process zones, vinyl roll-up doors help keep processes and materials moving by reducing door cycle times and allowing forklift trucks to pass through more quickly. How does this reduce costs? Heating and cooling cost reductions, improved productivity rates that make man-hour costs more efficient, and creating secure dock access that reduces theft and pilferage on-site - are all important cost savings that add directly to your bottom line. Improve your facility air flow while still keeping the dock door open in spring or summer months. Durable mesh doors help reduce cooling costs in warehouses, manufacturing plants, or distribution centers while blocking out pests and debris. Great for production facilities, paint shops, or areas where high-tech equipment may be damaged by airborne dust and debris. Custom configurations available. Please call customer service for assistance or for more information.